This is a show about birth, but not... you know...like that. See this show and Dadman for just £15 - please call our box office on 01423 502116 to book. Its really hard to talk about birth without descending into enormous clichés. So we are going to do it with ferocity and comedy. And a glitter bomb. Katie and Laura talk about birth in different ways. They made a show to challenge that talk, challenge each other and challenge the accepted. 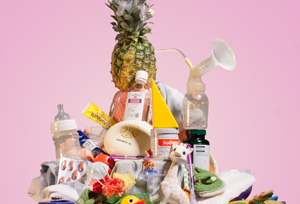 WILD is new bold piece of theatre about how we might be using the wrong language when we talk about birth. It is part riot, part disco, part rite of passage. Expect comedy, music, loudness and bold talking. And a glitter bomb. STITCH is a pop up exhibition of embroidered birth stories, created over a series of workshops with mothers. Participants were invited to come together to share experiences and to create an embroidered work of art that responded in some way to their own unique birth story. STITCH is a satellite project to WILD and works as a companion exhibition to further the conversation about how we talk about birth. We invite audiences of Harrogate Theatre to make your own embroidered rings using our STITCH packs. You are invited to post them back to us and then form part of the exhibition that will tour with WILD throughout the U.K.